To understand moisture removal, it's important to brush up on a bit of physics. This LG window air conditioner at the BuildingGreen office has a setting that maximizes moisture removal. Last week, I addressed strategies for controlling moisture sources in homes during the summer--one of the contributors to discomfort during hot humid summers. This week, I'll examine how to remove unwanted humidity using air conditioning equipment, starting with some fundamentals. To understand moisture removal, it's important to brush up on a bit of physics. Air is able to hold only a finite amount of water vapor, and that amount is governed by the temperature of the air. Warm air can hold more moisture than cool air. This is why water droplets appear on that cold glass of iced tea: the outer surface of the glass is cold so the air close to the glass cools off and the amount of moisture it can hold drops. When that air temperature cools to the "dew point," it means that 100% "relative humidity" is reached; as it cools further, water vapor in that air "condenses" out as liquid water. (Relative humidity is the amount of water vapor in air, expressed as a percentage of the total amount of water vapor that air could hold at that temperature.) The higher the relative humidity of the air, the higher the dew point temperature. On a really dry day (low relative humidity), not much condensation will form on that glass of iced tea, while on a day with 90% relative humidity, condensed water will drip down the glass and pool on the table it's sitting on. All this is important to know, relative to moisture removal, because that's exactly how most mechanical air conditioning systems work. (I'll cover dehumidifiers next week.) Copper coils in these systems carry cold refrigerant (heat-transfer fluid), and as household air is blown past these coils, moisture from the air condenses onto the coils and is captured. Standard compression-cycle air conditioners (both window units and whole-house models) remove moisture through condensation, as described above. Their effectiveness at moisture removal varies, however. Moisture-removal is reported several ways. On product literature, pints per hour or liters per hour is usually listed. A modest-sized, 12,000 Btu air conditioner, for example, such as the LGmodel in the BuildingGreen office that's pictured here, typically removes between 3 and 4 pints of water per hour. Unfortunately, as the energy efficiency of an air conditioner goes up--higher EER (energy efficiency rating) or SEER (seasonal energy efficiency rating)--the moisture-removal performance usually goes down. 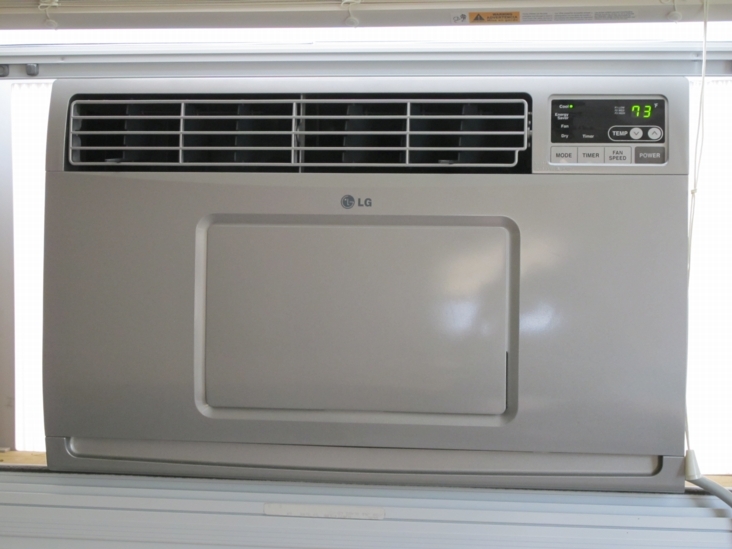 A special "dry" setting that maximizes moisture removal on this LG air conditioner can help in humid weather. Dehumidification efficacy is also measured by the "sensible heat ratio." (More terminology, I'm afraid: "sensible heat" refers to energy associated with a change in temperature; "latent heat" refers to energy associated with a change in phase, such as from vapor to liquid--which might not involve much change in temperature.) The sensible heat ratio is the fraction of the total cooling energy used for sensible heat removal. Thus, a sensible heat ratio of 0.8 means that 80 percent of the energy used by the air conditioner goes toward lowering the air temperature, while 20 percent goes toward moisture removal. To achieve comfort in our houses, we need to both lower the air temperature and reduce the humidity. Selecting air conditioning equipment involves considering the desirable balance between sensible heat removal and latent heat removal. In a very humid climate where lowering the humidity is almost as important as lowering the air temperature, a low sensible heat ratio--say 0.75 or lower--makes sense. In highly energy efficient homes, humidity removal is also often more important than cooling (because less unwanted heat gets in), so a low sensible heat ratio makes sense--or even a dehumidifier, which usually provides no actual cooling. Success with air conditioning and moisture removal also involves equipment sizing and operation--it gets pretty complicated. If an air conditioner is oversized, it will operate for only short periods of time, and that will reduce the moisture removal performance. The ideal is to have the equipment sized so that it will operate fairly continuously during peek cooling periods--rather than switching on and off frequently. It also improves moisture removal to operate air conditioners on a lower setting. Blowing air across the coils more slowly increases moisture removal, so if you're buying a new unit, look for a model with variable cooling output (or a high moisture-removal setting). An air conditioner technician or mechanical engineer will help you choose the right product for your situation. He or she will considerable the variables (climate, moisture sources, cooling loads, etc.) and suggest a solution that makes sense. Don't forget that the less you use an air conditioner, the lower your energy bills, so pay attention to the simple strategies for reducing cooling loads and controlling moisture that I've covered in the past two weeks. Alex is founder of BuildingGreen, Inc. To keep up with his latest articles and musings, you can sign up for his Twitter feed. 1. size the AC unit for the room and load; units that are too large and short-cycle don't remove moisture as well as right-sized units that might run a bit longer, but that is what is needed to get the coils cold enough to condense vapor in the air. 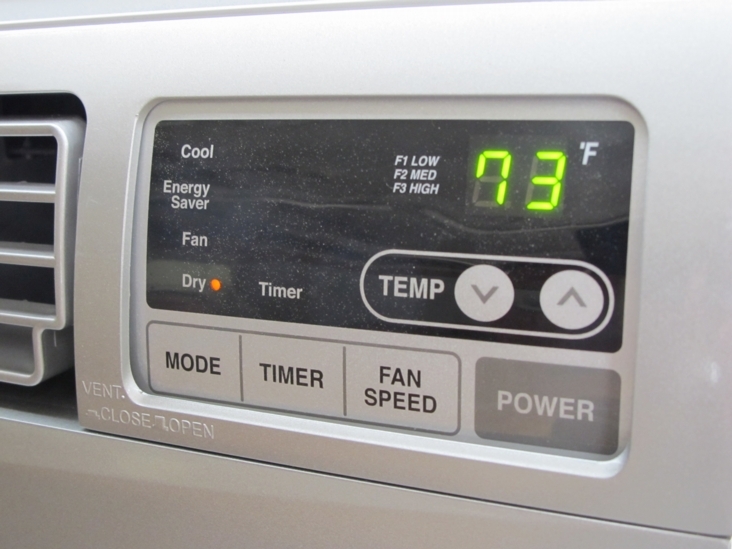 2. look for AC units that have variable speed and run on lower fan setting because the more time air spends on or near the cools, the more moisture gets removed. 3. make sure that if your AC window unit has an exterior air vent, that it is CLOSED. 4. if you purchase a DH Gate thermometer/hygrometer (see it referenced in this blog I wrote: Understanding and Measuring Humidity, https://www.buildinggreen.com/blog/measuring-and-understanding-humidity) which also shows dewpoint temperature, you will actually know if your AC unit is dehumidifying: a lower dewpoint temperature, regardless of how both the air temperature and relative humidity are changing means, you have moisture removal. 5. make sure your unit is tipped slightly out and that the drain is clear. 6. coils get dirty over time and the fins just behind your grille get crushed. Dirty coils remove less moisture and bent fins reduce the effectiveness of your AC unit overall. Help! We have a wall unit a.c. The room feels damp, papers and bedding feel damp. There is not any water dripping from unit when viewing it from the outside. Where is the excess moisture going if it’s ‘pulling’ from the air inside? The wall inside and out feel and look dry. If not pulling and seems the case as it feels soupy when u walk in, how can we get it too extract this moisture? There is a funky smell coming from the A/C vents when blowing air. It gives me a headache, can't breathe, and my nostrils can't take the smell. The A/C company confirmed that our coils were clean and added free-on (not sure of spelling). How do we get rid of the smell. My husband did put a humidifier in the living room and it helped. Is that the solution? Thank you for your input. Firstly, if you look in the ASHRAE Handbooks, you will find a full explanation of the reasons why right-sizing, or even slightly under-sizing packaged (DX) HVAC equipment can be beneficial at times of peak cooling load. Basically, apart from the continuous removal of moisture, which is what concerns this article, continuous operation of the refrigerant compressor ensures that, even if the space temperature does rise a little above the thermostat setting, the lack of temperature fluctuation from unit cycling and very slow rate of rise means that the excess usually goes unnoticed. In contrast, if the equipment is over-sized - on the principle that bigger must be better - when it operates, the temperature drops rapidly but, when it cuts out on low temperature, the "short-cycle lockout" control may prevent it starting up again before the temperature has risen above the cut-in point. This produces uncomfortable rapid temperature fluctuation over a wider range than normally permitted by the room thermostat. The switching on and off of the compressor also causes fluctuation of the background noise level, whereas that from the continuously-operating equipment can be "tuned out" by the brain. Secondly, while blowing air across the cooling coil more slowly at "low cool" with a low temperature setting can be more efficient for moisture removal, it can also cause coil icing, when there is neither cooling nor moisture removal. Fortunately, this situation is usually signaled by the affected unit making a throbbing sound as the fan begins to "surge". If you suspect icing in a window or split unit, just slip out the filter to see the bright white coating of frost on the coil. The cure is to switch off the cooling while leaving the fan running and wait for the circulation of warm air to remove the frost. The cooling can then be switched on again. If the trouble recurs, the unit should be operated at medium or high speed and/or with a slightly higher temperature set point. I am wondering about your opinion with regard to the thermostat setpoint and how it relates to the RH (specifically problems that can occur at setpoints below 65 degrees). Also, a discussion about the best way to use ERVs in a system in a hot/humid climate without adding excessive moisture to the air stream. I noticed on the first post at the top of your page that you said humidity should be between 50-60 percent. That IS a good range, but if you've ever had a problem with mold in your home, it's really bad to have it that high. The government energy websites all say 28-35 percent for people that have water leaks a lot and previous mold problems.